Join the discussion on our forums! Come discuss Dragon Soul over in our dedicated Dragon Soul discussion topic. After you cast 3 spells in a turn, summon a 5/5 Dragon. Crafted by Deathwing's goblin horde, but the dragon added the rainbow sparkles himself. 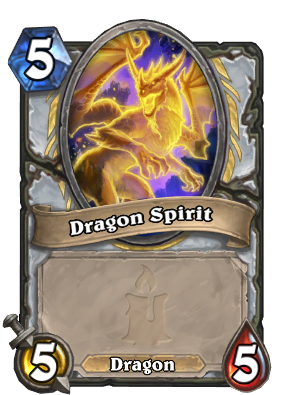 3 spells is just too high requirement for priest to summon a dragon regularly. You may do it once or twice and you have no cards left. It's hard to read another person comment right. Blessing of Kings is a card that only paladin runs, Spellbenderwould be good if you're trying to counter a paladin deck. Acidic Swamp Ooze is a neutral card that any class can run. And not surprisingly, many meta decks run it. Can you tell the difference now? Put it in my highlander, replaced kabal talon priest with it. So far have summoned one relevant dragon, and another on a killing turn. Every time I hear the "clink" it makes me want to irresponsibly cast more spells just to get the dragon. Idk. Could take or leave it really. Update: when your putting out Lyra, using coin, potion of madness, silence, shadow visions, etc all the while producing more spells with Lyra, it's actually kind of a butch to deal with. Last game I got 2 relevant dragons and they expended my opponents resources enough to where I feel it won me the game. You're already casting the spells. Get a 5/5 body out there for 3, 1.5, or even .75 mana. Dragon Soul is too gimmicky to build a deck around it. Building your entire deck on the basis that you can draw and play it, and have that weapon stay up long enough to actually get Value out of it only happens with a lot of luck. Most people have Acidic Swamp Ooze against Mage, Warlock, Rouge, Warrior and Paladin ATM. which is the only stuff on ladder right now. If Cavern Shinyfinder where a Neutral Card this would be a fun deck. But sadly it's just another Highroll Priest. Maybe it will find it's way into a decent deck in the future, but for now it just is too inconsistent. It is usually a bad idea to build a deck around 1 card. I do agree with that. I don't know what deck "this deck seems to just loose to most tempo decks or the super greedy or slow control decks" are you referring to, but my experience is different. Basically, Dragon Soul is like a Sherazin, Corpse Flower. You can put them into Miracle-Style decks that can play many cards in one turn and can get a lot of value from both of these cards. Sherazin, Corpse Flower may only give you 1 flower-bud at a time, but it puts down board presence. Playing any card will resurrect it. Dragon Soul doesn't do give you any tempo. There is no limit to the amount of dragons, and it is not weak to silence. However, it in a way starts dormant and is limited to spells only (played cards would be insane). 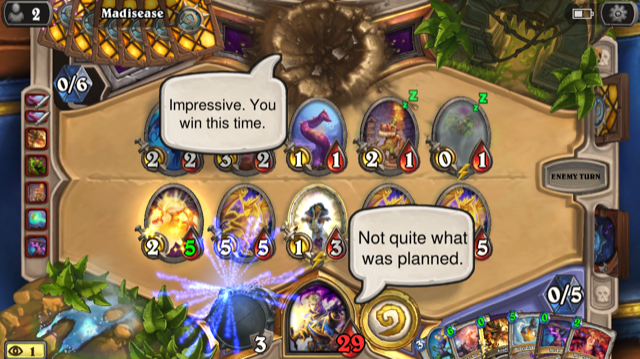 The deck I was playing with this was an Inner Fire Combo Priest with Lyra, and later a miracle-style deck. When I had an ideal set up, it often ended up in the bottom half of the deck or I just did not need it to win. And when you have it, it sometimes doesn't do anything for a while. It's a fun card, but way to inconsistent. Granted I wrote that when Tempo Rouge, Aggro Paladin etc ran you over; meanwhile RazaPriest and Spiteful Decks outvalue you. Maybe with Patches and Raza nerfed it works now. This card is just awesome! Deck with cheap spells, radiant elemental, Lyra, Yogg even Your opoonent cards too. Every single game is different and super fun too. "Ok..... i got this 7/3 Weapon... just a bunch of big poking damage aaaand..."
Maybe he tried to do it on purpose? I constantly see people putting this weapon and "Dragon Priest" in the same sentence. I don't understand why the confusion, although perhaps coming from a community that thought Bladed Gauntlet + Bring it on was a broken aggro combo, not that surprising. 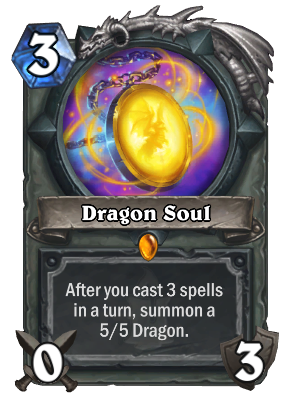 Dragon Soul is quite obviously not intended to be put into a Dragon deck. For one, Dragon decks mostly center on board control -> minions -> you just rarely play 3 spells in a turn. And finally and perhaps most importantly, all Dragon synergy revolves around holding a Dragon in your hand which is what this weapon quite clearly does not do. So this weapon and Dragon decks live in two separate universes. Thank you for stating this. This was the legendary that I got, and my friend kept telling me to make a dragon priest. Filthy pleb.